Update your home and keep it classy with this transitional style Chest. Featuring five drawers with stainless steel handles for easy opening and closing, this chest provides you ample of storage space to store your delicates and any other belongings you want to tuck away. Its angled legs adds stylish appeal and provides excellent support, while extra lift makes it easy to sweep and vacuum underneath. Made from sturdy wood in a walnut brown finish, this chest will blend well with a variety of color schemes. 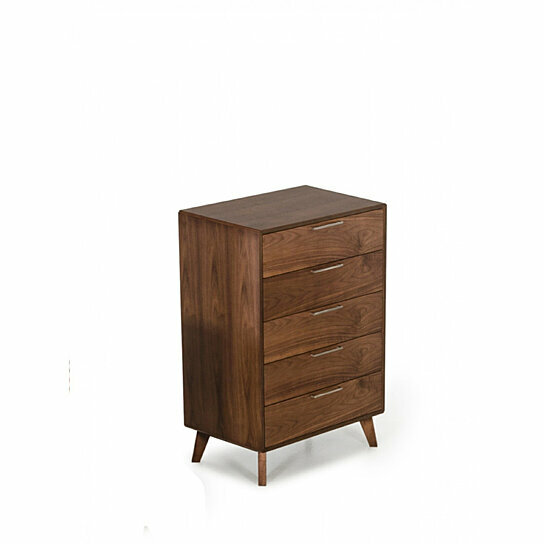 The chest features five drawers with bar handles for easy opening and closing. The chest is made from sturdy wood for lasting usage. The chest will add a transitional style to your bedroom.